Definition at line 148 of file app-layer-parser.c. Definition at line 163 of file app-layer-parser.c. 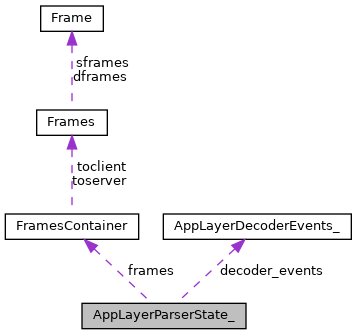 Referenced by AppLayerParserGetDecoderEvents(), AppLayerParserHasDecoderEvents(), AppLayerParserSetDecoderEvents(), AppLayerParserStateFree(), and AppLayerParserStreamTruncated(). Definition at line 150 of file app-layer-parser.c. Referenced by AppLayerParserParse(), AppLayerParserStateIssetFlag(), and AppLayerParserStateSetFlag(). Definition at line 154 of file app-layer-parser.c. Referenced by AppLayerParserGetTransactionActive(), AppLayerParserGetTransactionInspectId(), AppLayerParserSetTransactionInspectId(), AppLayerParserStreamTruncated(), AppLayerParserTransactionsCleanup(), and UTHAppLayerParserStateGetIds(). Definition at line 158 of file app-layer-parser.c. Referenced by AppLayerParserGetTransactionActive(), AppLayerParserGetTransactionLogId(), AppLayerParserSetTransactionLogId(), AppLayerParserStreamTruncated(), AppLayerParserTransactionsCleanup(), and UTHAppLayerParserStateGetIds(). Definition at line 160 of file app-layer-parser.c. Referenced by AppLayerParserTransactionsCleanup(), and UTHAppLayerParserStateGetIds().